Konstantin Korovin left behind a lot of work – he painted landscapes, portraits, decorative panels, and also engaged in the artistic design of theatrical productions, creating scenery for various performances. Especially a lot in his legacy of a variety of still life with flowers. The still-life stands on a wide window-sill in a city apartment covered with white cloth. On the left is a white vase with a lush bouquet of flowers – graceful rose buds of a dark red shade stand out against the background of violet violets. On the right is a broad faience dish on a high stand, full of blue-black and yellowish clusters of ripe grapes. In the foreground, the viewer sees a metal tray with a gilded teapot, a spoon and two ripe peaches. Behind all these items is either a picnic basket, or a small chest. The background for the still life is a window with the evening urban landscape of Paris. Against the background of dark bluish twilight, illuminated windows in the house opposite, and dim lights of yellow street lamps, are visible. The picture is written in broad juicy strokes – it, like all works in the style of impressionism, is better to watch from a distance. Up close, it seems somewhat coarse. At the same time, the texture of the objects is transmitted remarkably – bright mirror highlights from the street lights on the tray and on the side of the teapot facing the viewer, the ripeness and transparency of light grapes, the roundness of peaches. 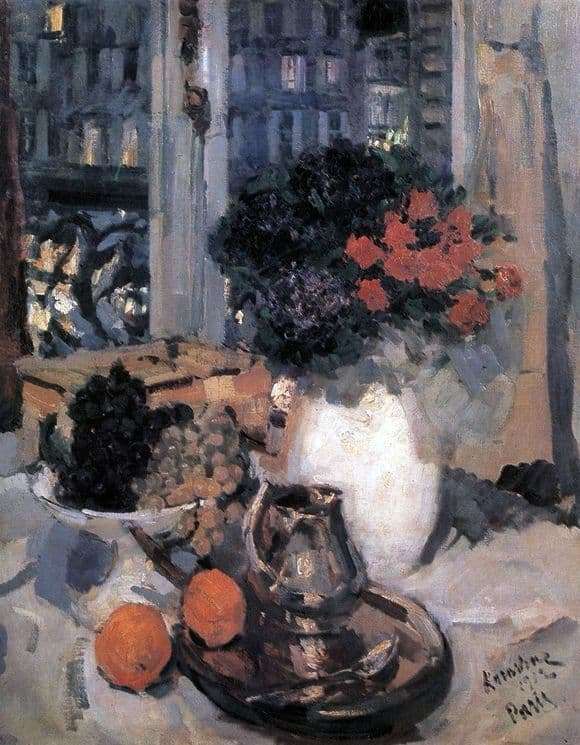 Still not knowing about such a direction as impressionism, Korovin painted pictures in this style. The artist believed that the main thing in the picture is the sound that is in harmony with any kind of human heart, not the beauty of the image, while creating amazingly beautiful landscapes and still lifes in the technique of decorative impressionism.